We’re sitting on folding metal chairs in the cement compound waiting to be summoned by the customs official who holds our destiny in his hands. What is supposed to be a waiting area for those exiting Iran looks more like the holding pen to a prison. Border guards shuffle in and out keeping an eye on us. They’re supposed to be intimidating, but the effect fails. They are all tall, scrawny men, some of whom stoop as they walk. Their wool blankets draped around their shoulders are soiled from the sand and the sandals on their feet are worn out. The only thing that makes us think we should be paying them deference is the barrel of a Kalashnikov rifle that peeps out from under the layers of clothing. They’re all tired and hungry – it’s the end of another day during Ramadan. They wish we’d go away because the sun has almost set and all they want to do is eat. Finally my name is called, or rather, one of the starved guards comes out and starts waving his hands furiously in my direction. I enter the dark, dingy room where the tired and disgruntled official is sitting with my passport in his hand. He has to squint when he looks up, the light has faded and sand hangs suspended in the air. “Who’s thees?” He’s pointing at my passport photo and looking back and forth between it and me. I respond that it’s me which elicits his barking response, “Thees is not you! Thees is small boy!” I offer to take off my headscarf, a cheeky suggestion since we’re still in Iran and it’s the law that every woman cover her head. This makes him pause for a moment and makes me think that I’ve just blown my chance to enter No Man’s Land. He keeps glowering at me, trying to be intimidating, and all the men in the room are silent as they’ve watched this game before. Finally after what feels like an eternity, he picks up his stamp and thumps it on my passport. 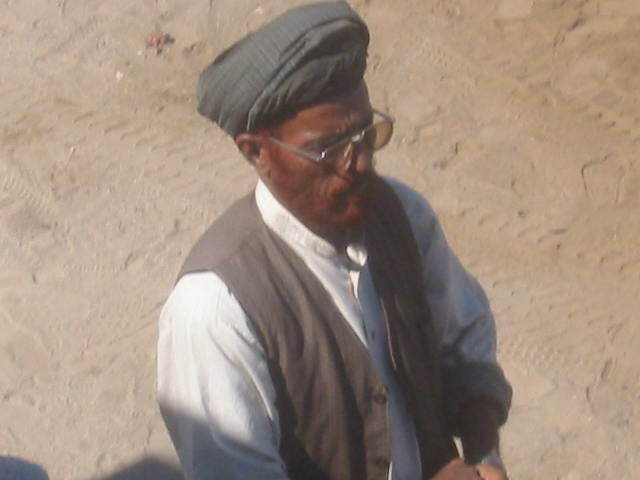 He has just granted permission for me to enter No Man’s Land and walk the 50 metres to the Pakistan border and the tiny village of Taftan. It only takes about a minute to walk the distance, and in that time we enter a ghost town inhabited by garbage and dead vehicles. A plastic bag blows across our path and the sand that follows it covers our clothes and hair and coats our teeth. Stray dogs are darting in between the few trees that are dying of thirst, and a truck carrying about 15 Pakistanis in the back rumbles past us as it drives off into the evening. And everything – absolutely everything – is knee-deep in sand. Unlike the Iranian compound, the Pakistani one is a glass and cement structure that offers protection from the sand as we wait inside, sitting on plastic furniture, for the entry stamp. And the border guards here are friendlier although none of them understand why we want to visit their country. They keep looking at us, shaking their heads and smiling. When all of us have cleared customs, we’re allowed to re-board our truck and head to the vehicle registration site. There’s no suspension on the truck and we feel every hole and rock on the 200 metre journey. It’s not really a road, more of a path heavily pock-marked by desert boulders, abandoned engines and radiators, and stray dogs. We also have to dodge the approaching trucks as they weave dangerously to avoid the same obstructions. We finally reach the chain-linked, paved parking lot and drive to the back where another cement and barb-wired compound squats at the base of the desert mountains. The guards here initially ignore us. Their Kalashnikovs are either propped up against the wall outside the building or lying at their feet, and they’ve traded these weapons for equally scary looking cooking knives as they slice and dice vegetables for Iftar, the post-fast meal. The sun has finally set and all the Muslims, which is everyone but the 11 of us who’ve been sneaking snacks all day, are more intent on eating than stamping our truck papers. But entertainment is close at hand and some of us cross the parking lot to check out what looks to be a circus. It’s actually just a bunch of Pakistani transport trucks and their drivers. 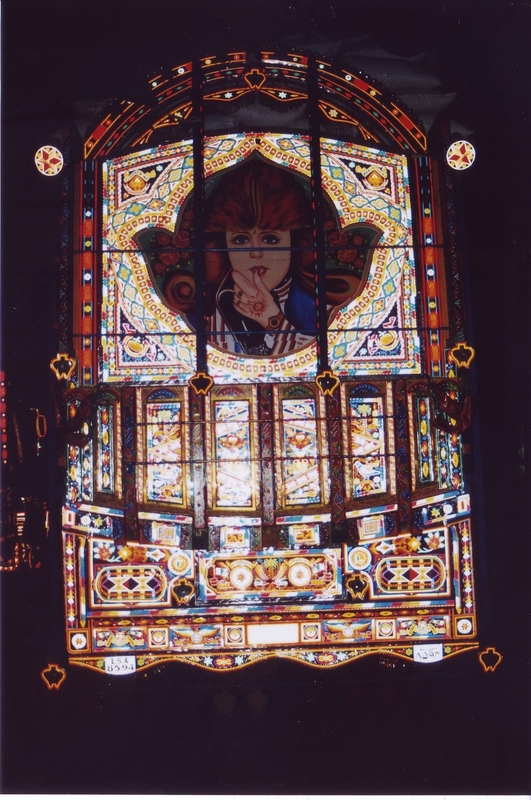 But these trucks are the most elaborately decorated vehicles on earth, and the drivers proudly grant us permission to do a walk-about and touch the works of art – they’d join us, but they’re too busy squatting on the sandy pavement stuffing their mouths with food in rapid-fire motion. These transport trucks are not your standard one-ton cab and silver flatbed. They are moving stain-glassed windows that reflect and shatter light in the setting sun and in the headlights of approaching vehicles. 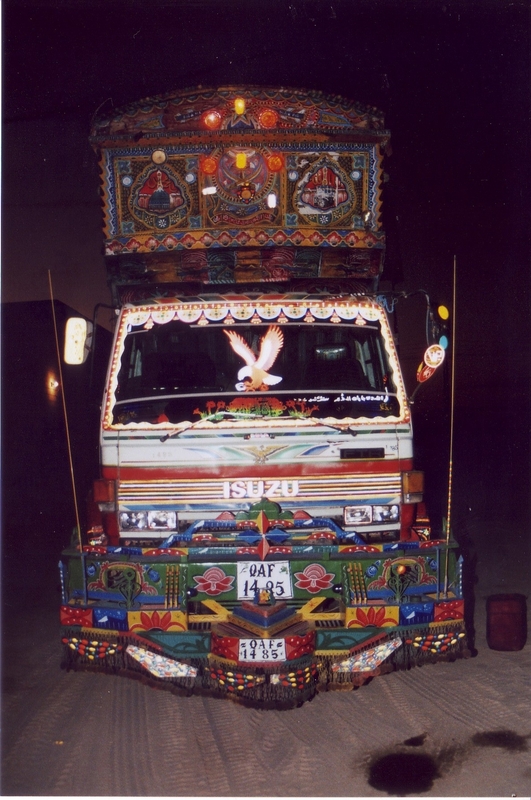 Each truck is built up over 14 feet from the axles with wood and aluminum siding, and painted in colourful, elaborate patterns, pictures, and Arabic script. The side view mirrors are mounted on the front of the truck, more to reflect the headlights back onto the masterpiece than to give the driver an actual side view. 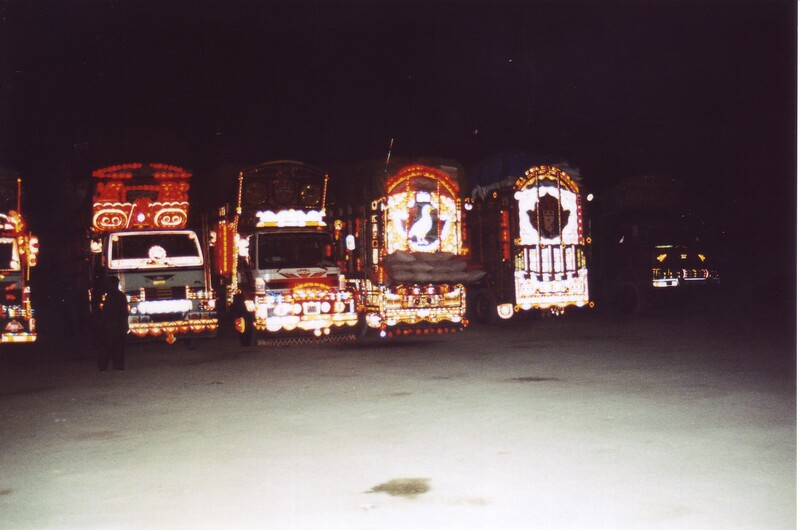 If for some reason you miss seeing them, tiny chains and bells are hung in rows from the bumpers, and when the truck moves or the wind blows, they sound like desert windchimes. We all snap pictures like we’re Japanese tourists and jaws are on the ground as we realize every single truck is done in such a manner. Finally the papers are stamped and we are dragged back to our bright blue, tired, old boring truck. Right now our safety is at risk – a decision has been made and a bargain has to be struck with the border guards. 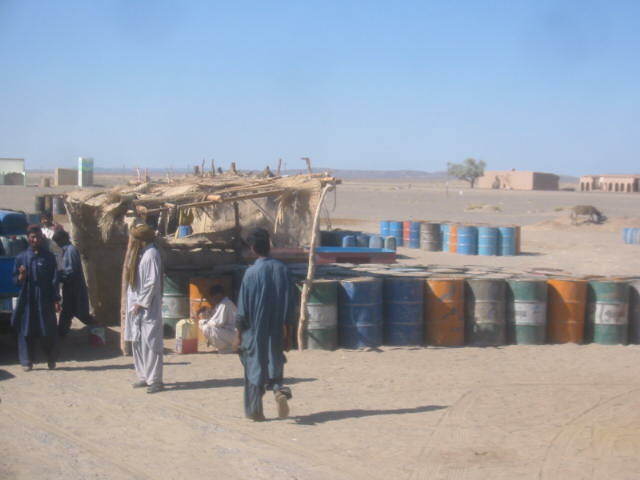 We are at least 14 hours away from the next nearest city, and all the land between Taftan and Quetta is tribal territory. The government promises protection up to 10 metres either side of the highway. After that it’s tribal law. Not even the seasoned truckers venture out alone, and soon the border is being abandoned as they drive out in two’s and three’s. After some discussion and negotiations with the border officials, we are given permission to camp beside their compound. The guards will provide protection for our group overnight, and it has never felt so right sleeping under the barrel of a Kalashnikov. The next morning we’re up before the sun and we fly out of the parking lot like bats out of hell. The journey will take at least 14 hours and the goal is to reach Quetta as close to sundown as possible. The first four hours are easy-going, the road is narrow but paved and without too many potholes. We stop briefly to negotiate illegal fuel prices with a tribal chief. His weathered skin is almost the same colour as his faded, hennaed beard. Another hour down, and all of a sudden and out of nowhere, a little pickup screams past us and screeches to a halt, just metres in front of our bumper. Out jumps a border guard from the night before. He grabs his bag out of the back of his friend’s truck and proceeds to strong-arm his way onto our truck. According to him we had promised him the night before to take him as far as Quetta. None of us remembers this exchange but there doesn’t seem to be much we can do. So happy guy gets in the back with us and proceeds to pull out a bottle of gin. We’d tried the stuff the night before and it tasted more like cleaning solvent but he appears to be enjoying it. Too much so and soon his drunken behaviour is making us all a little nervous. Sure enough we get pulled over in a random military spot-check and as the army boards the passenger area, we try to act nonchalant while the whole time we’re praying that we won’t get charged with conveyancing and harbouring a Pakistani citizen. Fortunately the army figures everything is ok and we’re allowed to proceed on our merry way. By this time the sun is overhead, the air in the passenger compartment is heavy and stagnant. The smell of diesel wafts through as the full fuel tanks leak a little and send the odorous fumes our way. The paved road ends all of a sudden and is immediately replaced by a pock-marked single-track trail. Even though it slows us down, the rest of the drivers on the trail continue at the same break-neck speed as before and whiz by us, kicking up clouds of sand and rocks. And since the road is so narrow, jockeying for space becomes a game of chicken when vehicles approach. This continues for the next eight hours and we’re still over 60km from Quetta when the sun disappears behind the mountains. In the dark the drive becomes much more treacherous. In addition to negotiating potholes, boulders, other trucks, our hitchhiking guard is slowly sobering up, much to his unhappiness. Occasionally he demands that the truck stop, at which point he jumps out to be swallowed up by the black night for five or 10 minutes. Then he gets back on and we continue the trip. Finally, 16 hours after the trip started, the lights of Quetta twinkle in the valley below and we coast into a campground where hot food and hot showers await. After setting up the tents, showering away three days of sand and dirt that coat every part of the body, and eating the first hot meal since leaving Iran, we receive some unusual visitors. A Pakistani national is being executed by the United States in less than 36 hours, and the local police, fearing retaliation against foreigners place us under house-arrest. Mir Aimal Kasi had killed two C.I.A. agents in the early 1990’s and his sentence is up. As his family lives only five minutes from our campground, we’re assigned additional guards and advised not to leave the grounds. The confinement means that we have time to clean the truck, camping and cooking gear, and recover from the previous day’s driving torture. But by the early evening, the boredom is such that when the Anti-Terrorist Task Force comes by to make sure we’re o.k., we convince them to take us into town for a tour. Quetta is under a perpetual cloud of haze from the usual sand, but also from the smoke that seems to pour forth from street vendors selling food. No women are present except for one or two that are hidden from view by their burqas and protective male relations. I’m not wearing a scarf anymore and am starting to feel obvious so Arnout gives me his hat. After about an hour of driving and souvenir shopping, nothing is drawing attention and nothing is out of the ordinary apart from us, so the officers take us out to a local stand for something to eat and evening conversation. When we’re done there they take us back to the campground for another evening of tea, toast, and backgammon. It may not be Fantasy Island but I can’t think of a better way to enter the country.